South Indian breakfast goes for many varieties of healthy and super filling dishes, one among those famous breakfast dish is softy Idlies. Idly batter is definitely very handy, after fermentation the first day you can make soft idlies, after two or three days you can make super crispy dosas and once the batter is bit sour you can make spongy,thick uthappams. Obviously i'll make idly batter once a week and i'll try to keep adding millets in my usual idly batter whenever i feel like feeding my family with millets. One of my recent trail is this little millet and black urad dal batter.Since the batter turned bit dull in colour, i dont want to prepare idly with it and went for making this super crispy dosas.Sending this crispy dosas to MLLA 73 hosted by Radhika, event by Susan and Lisa. Little millet also known as small millet are certainly very versatile, you can make variety of foods with this healthy,gluten free grain.My trial of making dosa batter with little millet turned out extremely fabulous. Needless to say how crispy and prefectly these dosas came out, the picture itself speaks a lot na. Eventhough the colour of the dosa looks very different from the usual dosas, tastewise you cant find any difference with this healthy combination.We had a fantastic dinner with this crispy dosas and everyone at home enjoyed thoroughly their dinner.This is my second post for this week's blogging marathon as i choosed All about millets as theme for this first week of this month's blogging marathon.Sending this post to Ahlan Ramadan-The Healthy Way. Check out the Blogging Marathon page for the other Blogging Marathoners doing BM#42. Wash and soak the little millet,parboiled rice together and whole black urad dal with fenugreek seeds separately for atleast 4 hours. Grind as bit coarse batter with enough water in a grinder and add enough salt, mix well and keep it for fermentation. The next day while making dosas, give a stir to the fermented batter. If your batter is thick, just add water to make them little bit thin. Heat a non stick pan, grease the pan with oil using a paper towel. Now pour a spoonful of batter and turn in clockwise to small circles..
Drizzle few drops of oil around and flip the other side and cook well. 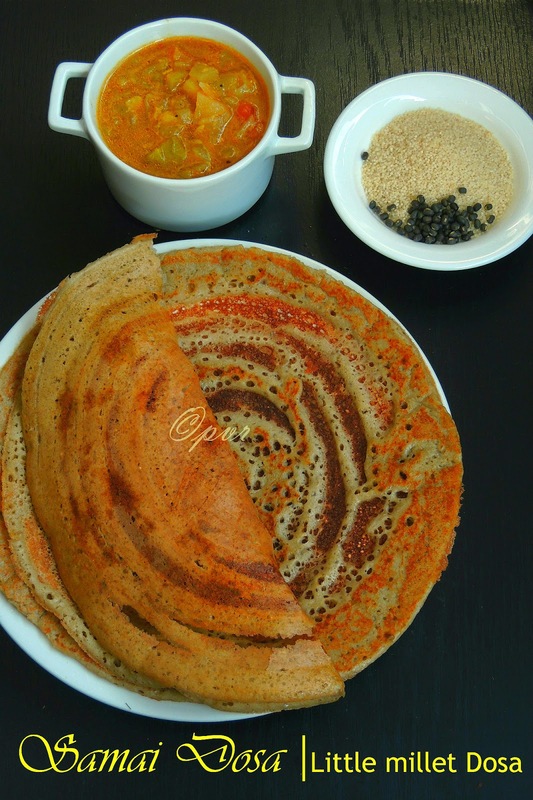 Serve this healthy dosas with any sort of spicy chutneys or sambhar.. 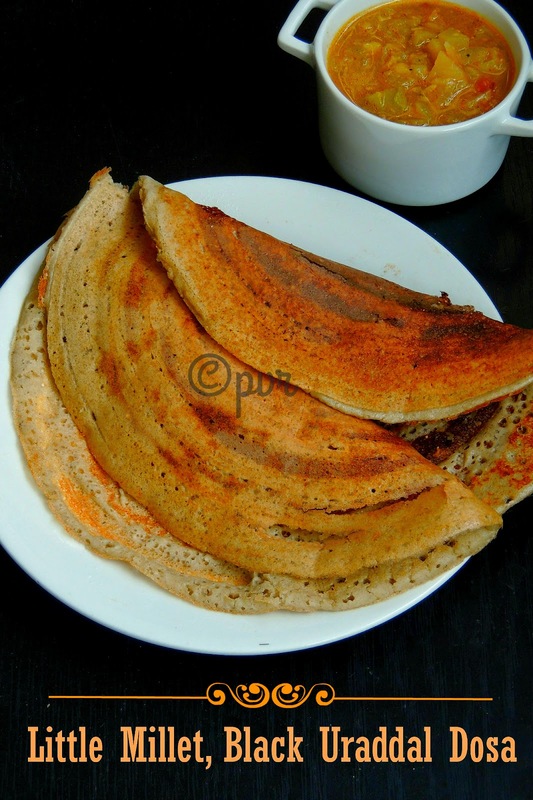 Superb Millet Dosa. The pic itself speaks about how awesome this dosa had turned out. Delicious and lovely looking dosai. Wonderfully prepared. I want to have that dosa.. so so delicious.. I'll love to have that crispy yummy dosa.. Such a healthy dosa Priya..very good one..
Lovely healthy dosai! I am so tempted by the pictures! Such a healthy dosa, and delicious too..
very healthy n unique,Priya..great job!! Healthy dosas aks, yet to lay my hands on making dosas with millets. Your recipe seems easy too will try it sometime. Delicious and yummy looking dosa. Wow, those dosas look so crispy and yummy. Love the crunchy look of the dosa! looks so crispy and delicious!! Dosa looks so good Priya! Dosa looks crispy and tasty ! Wow. .these dosas look fantastic. .mouthwatering. .crisp n crunchy. Love the healthy touch to the traditional dishes. A must try recipe with Samai. You have got an amazing and healthy recipes on this blog.